A small tree with lavender-pink blooms in the spring. 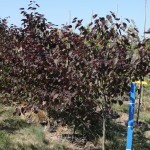 The heart shaped leaves emerge a bright red-purple and remain burgundy throughout the summer. It is adaptable to many soils, except wet ones.